On December 1st, 2017 the ECLA Executive Board held a meeting at dfv Media Group in Frankfurt am Main, Germany. 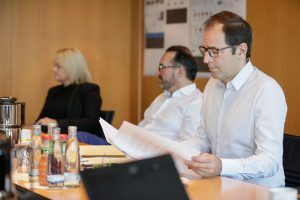 Apart from the members of the Executive Board, Dr. Michael Henning and Marcus M. Schmitt, representatives of dfv Media Group, joined the meeting. The participants discussed the strategy for 2018, the relaunch of the website of the association, various possibilities for conferences and events as well as establishing the new service company for ECLA in Brussels, Belgium. Also ECLA and its new service company “ECLA Association Services” signed the service agreement for the future.